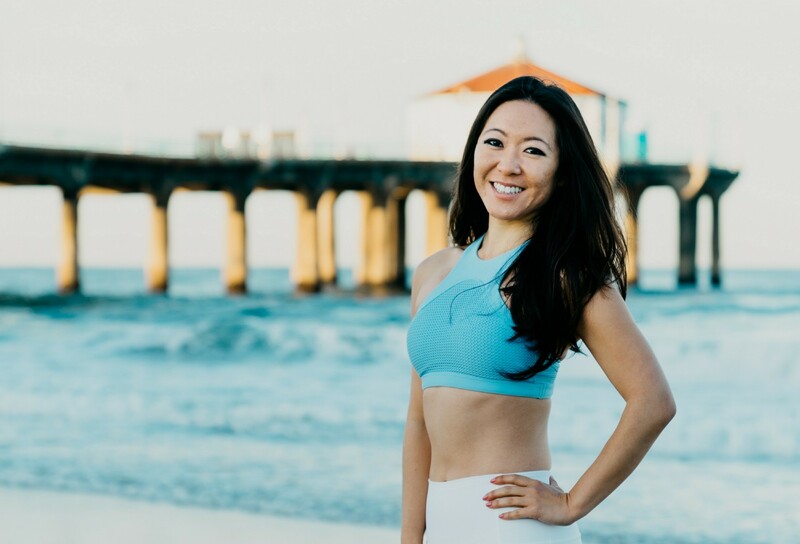 I had the pleasure of interviewing Melissa Okabe, Los Angeles Yoga Instructor, Yoga Alliance RYT-500, and Yoga and Fitness Model. Melissa has been featured in Yoga Forma (A Visual Guide for the Spine and Low Back), contributed to numerous online wellness publications, and leads public, private, corporate yoga classes and workshops in the Los Angeles area. Melissa is hosting a Yoga and Wellness Retreat to the Big Island of Hawaii in October 2018, and hopes to grow her career internationally in 2019. I was born and raised in Torrance, California and educated at The University of California, Los Angeles (UCLA), American University of Paris, and La Sorbonne. I took my first yoga class at UCLA over a decade ago, but really became truly consistent with my practice after moving back to Los Angeles from Paris, France. My yoga practice was key in helping to recenter myself mentally and emotionally during this transitionary period of my life. So inspired by this practice, in 2013, I enrolled in the 200 Hour Teacher Training at YogaWorks South Bay with David Lynch and Jorge Luna. After graduating from the 200 Hour Program, I continued my yoga education with a Therapeutics Teacher Training in 2014 with Wendy Garafalo and Chelsea Rothert at the Green Yogi Manhattan Beach. This training provided further practical training and modifications for injury management, chronic conditions, pregnancy, and yin/restorative instruction. Finally, in 2015, I completed the 300 Hours Professional Program through YogaWorks Los Angeles, under the mentorship of David Lynch. I currently teach Vinyasa Flow Yoga and Restorative Yoga at various studios and corporate locations in Los Angeles. I hope to pass on the gift of yoga to my students just as my inspiring instructors have done for me. I hope to provide a space for grounding and centering, self awareness, self confidence, self-love, and spiritual growth. This one is a hard one to answer because there have been so many interesting and unexpected blessings. A few that come to mind are modeling for the 2018 Yoga Publication, Yoga Forma written by Romy Phillips & Z Altug; Teaching for Yoga Gives to St. Jude through YogaWorks West Hollywood; and witnessing the daily evolution of my students’ practices and spiritual growth on and off the mat. I feel truly grateful and inspired when a student shares how this practices has changed them for the better- when they comment on how it allows them to experience a day without anger, sadness, or regret- it’s what makes this profession so rewarding. Yes! I’m looking forward to hosting my Big Island Hawaii Yoga & Wellness Retreat on October 4th-8th, 2018 at the WhaleSpirit Sanctuary in Captain Cook, Hawaii. I see this special project as an opportunity to provide a spiritually healing experience to my students, to guide them in further deepening their practices, and broadening my yoga instructor repertoire to include more travel related workshops and retreats. Increasing screen time has adverse effects on our physical, mental and emotional health. In terms of physical health, being on our screens (whether phone, iPad, laptop, etc) can contribute to neck and shoulder pain due to hunched posture (shoulders rounding forward, neck pitched forward, chin overly tilted downwards), and even back pain due to inactivity/ sitting for long periods of time. Screen time also affects our mental health because of the constant stimulation. Mental fatigue is often a result of overworking our minds, and it’s no wonder when our attention is often split between 2 screens, and our brain is constantly in an “active” mindset when on our phones, computer, etc. When we are not able to shut down and really relax- this can contribute to less restful sleep and/or insomnia. Finally, screens can negatively affect us emotionally because there is a constant influx of content (especially in the realm of checking social media constantly), which can lead to self-doubt, comparison with others, or social anxiety. Be Present- Make it a Habit to Pause Before Scrolling through your Phone: The next time you grab your phone to habitually check Instagram, Facebook or your app of choice, take a pause, and if it’s really not necessary- go back to doing what you were doing, and allow your attention to be focused and aware in that moment. Mental fatigue is often a result of overworking our minds, and it’s no wonder when our attention is often split between 2 screens, a task at hand, and/or comparing ourselves to others in an online world. Instead, allow your present task to be your sole focus for the amount of time you are spending on it- you will probably be more productive, focused and aware, because you are actually present doing that task. And if it is helpful, employ 5–10 minutes of mediation or breath-work to encourage this mental break and re-centering/ re-focusing of the mind. For a Better Night’s Sleep, Disconnect as Early as Possible from Technology. The bright light from your digital devices is stimulating, so the sooner you can get “offline” the better. Allot yourself at least 20–30 minutes of mindfulness practice such as meditation, restorative stretching, and/or pranayama (breathwork) before bed, and it should help get you out of the “active” mindset and into a more relaxed mental state. And we all know a good night’s rest is essential for the body to repair itself, encourages cellular regeneration, and elevates mood. Do an Act of “Analog” Self-Care Daily: Yes, online retail therapy is a real thing, but what’s even better is turning that much deserved love and attention inward. So even instead of watching Netflix to “relax,” maybe try something that gets you into your body, your breath, and the present moment. A simple restorative yoga practice can do wonders for the central nervous system. Here are some examples of restorative yoga poses that are easily accessible to readers of any fitness level. (A) Legs up the wall/ Viparita Karani: This restorative yoga pose helps to calm and cool the nervous system, and is great for insomnia, fatigue, anxiety. In this gentle inversion with the backs of the legs resting against the wall, the heart doesn’t have to work as hard to circulation blood through the body. It’s a nourishing, grounding and calming pose. Rest in this pose for 5–10 minutes. (B) Restorative Supta Baddha Konasana: Take one block on the highest hight toward the back end of your mat, a second block a few inches before it on the middle height. Lay your bolster over the blocks, top edge of the bolster on the tallest block, the bottom edge of the bolster will rest on the mat, creating a gentle incline like a ski slope. (If you need more support for your neck, place a folded blanket in a rectangular shape towards the top edge of your bolster) Turn away from your structure, sit bones on the mat an inch away from the bottom end of the bolster. Take the soles of the feet together, outer knees to the sides. Take your rolled blanket (long and skinny like a burrito), place it over the feet and wrap it under the outer legs for support. Gently lay your spine up and over the bolster, resting the back of the head to your bolster (or added supportive blanket). Allow the chest to widen, soften the arms to a low V position. If you tend to get cold, or would just like a little added weight for grounding in, place a blanket over the belly and legs. Close the eyes, relax and surrender. Rest here for 10–15 minutes, or as feels best for your body. Schedule in Social Time (Offline) : You know that uplifting feeling you have after a great, heartfelt laugh with a friend? Laughter is proven to decrease stress levels and release endorphins in the body. Genuine social connection is very important for mental health, and is more fulfilling for the heart than a “like”, “share” or emojis could ever be. While social media behind a screen can leave us feeling isolated, in-person quality time with loved ones helps us feel connected, gives a sense of belonging, and enhances positive shared energy/vibrations within us. At the very least, pick up the phone and have a great conversation next time, instead of simply texting. And when you do spend quality time with the people in your life, utilize the “quiet hours” function, turn your phone on silent/ off, or keep the phone off the table to not be distracted by incoming alerts. Spend time outside, instead of cooped up inside on your device: Even a 10 minute walk outside during your lunch break can do wonders to “reset” your mind and reboot energy levels. Let nature do your body good- with the sun helping us absorb vitamin D, and fresh air providing more oxygen to our bloodstream, it’s no wonder we feel great after a brisk walk or jog outside. The same can go for your morning or evening routines- you know that 30 minutes you waste sitting at the kitchen counter or couch scrolling through social media or online news? Treat yourself to some outdoor physical activity instead! Let the call go to voicemail if you’re not familiar with a phone number- if it’s important, they will leave a message. If the robocall leaves a spam message, block the number so you will no longer receive calls from that number. Turn off unnecessary push notifications (unless you work as a social media account manager, do you really need to know when someone likes your latest post? ), set quiet hours on your phone and adhere to them, or make it harder for you to get distracted by your phone by placing it another room while working or trying to focus on a project at hand or in your purse or pocket on silent when spending quality time with people in your life. Is there a better morning routine you suggest? Starting your day by checking your phone sadly puts your mind into a reactive mindset. The moment you open your emails, social media, text messages, you are being bombarded by stimuli, which means, most likely you are starting your day with undue stress. Instead, consider starting your day with a self-care routine like a gentle yoga practice, seated meditation, intention setting, or gratitude journal. This way, you can start your day by centering your mind, grounding your energy and providing a more balanced foundation to go about the rest of your day. Do the things that scare you, because if they scare you it means you are stepping outside your comfort zone- it’s an opportunity for growth- so don’t let fear hold you back from your own greatness. I envision a cultural movement where a specific hour a day (everyday) is collectively dedicated to self care (meditation, yoga, self-reflection in silence), where business and technology could be put on pause- much like the Spanish tradition of siesta, or “Earth Hour” which has been gaining momentum over the past few years. Connect with me on Instagram @melissao_yoga!!! Thank you for this interview. It was very insightful! This interview is part of an interview series by Dan Pannasch, Product Manager of RoboKiller, the robocall blocking app that gets even with spammers. You can check it out at robokiller.com.